Gordy Gritters well-known Benchrest gunsmith, along with Fred Zeglin custom gunmaker; wrote this definitive work detailing the processes required to extract all the accuracy possible from a rifle barrel. As a Gunsmithing instructor Zeglin found there is a lack of focused teaching material on the subject of gunsmithing. Gordy would have been somebody that P.O. Ackley would have liked because he never takes anything for granted. He is constantly checking measurements and testing new ideas in order to produce the most accurate rifle he can for his clients. 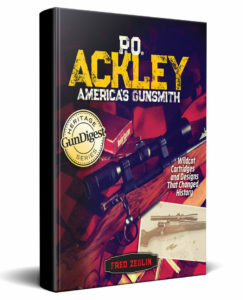 Each book in the series is focused on one narrow subject in gunsmithing. Written with an audience in mind who want to know every detail of the how and why of gunsmithing. These books are ideal for instructing classes on the subject of gunsmithing. The series provides a highly detailed and technical explanation of the subject at hand in a way that any gun lover will be able to understand, whether professional or hobbyist. “Chambering Rifles for Accuracy” is the third title in the series. The frist two titles were released in 2017: “Chambering for Ackley Cartridges” and “Understanding Headspace for Firearms”. These titles dovetail nicely with this new book as the subjects are all clearly connected. Installation of rifle barrels is a subject that is often seen as mysterious to the gunsmithing customer. Gritters and Zeglin explain every facet of the subject in a complete and technical way that allows any reader to fully grasp the intent and meaning. Clear photos and diagrams aid in the explanation of complicated processes. Albert Einstein said, “once you stop learning you start dying” that applies to the gunsmith as much as to any other vocation or avocation. In Part I of the book the work necessary to create a sub MOA hunting rifle is clearly explained. Related material on reloading, triggers, bedding , rechambering of existing barrels for best results is covered as well as dealing with extractor cuts in barrels. In short, this part of the book talks about most all the variables that effect the accuracy of any rifle barrel. In Part II Gritters lays out a step by step barreling process for the best possible benchrest barreling job, going far beyond the basics,. Gordy leaves no stone unturned in his search for best methods to achieve accuracy, he willingly shares all that experience with the student. 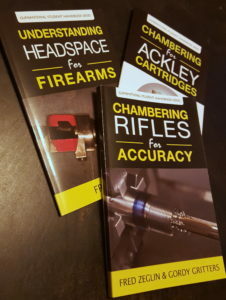 Combine this title with “Chambering for Ackley Cartridges” which explains how to headspace Ackley Improved designs and you are ready to build some extremely accurate rifles. All can be purchase here.